Even if you weren't lucky enough to receive Steam Machine beta hardware from Valve, you can still peek under the hood of its living room gaming computer thanks to a new teardown. The team at iFixit managed to snag one of the 300 Steam Machine prototypes in the wild in order to perform a step-by-step disassembly of the Steam OS-powered system. Of the all-important repairability, the teardown team noted that this particular "Steam Machine is designed to be opened and worked on. The case is secured with a single Phillips #2 screw." 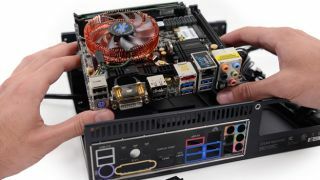 "Modular design with off-the-shelf components makes it easy to remove and upgrade the hard drive and video card," said the website. That's great for the typically more advanced 65 million Steam users that may want to tinker and improve their living room gaming chassis in the future. Scoring an impressive 9 out of 10 for repairability, this Steam Machine prototype presented only a few challenges for the teardown experts. RAM was hard to extract due to the motherboard cowling, and it may require users to remove the it, the iFixit noted. Also, since the hardware is so new and not at the consumer level, reassembly and precise cable routing were said to be difficult. There's no readily available repair manual for something like this just yet. Tearing open Valve's companion cube package, the team found plenty of familiar internal specs and external ports. This specific Steam Machine was being powered by a 3.2GHz Intel Core i5-4570 processor with a max turbo frequency of 3.6GHz. The all-important graphics card was a ZOTAC GeForce GTX 780 3GB GDDR5 GPU and there were two Crucial Ballistix Sport 8GB DDR3 (PC3 12800) RAM sticks for a total of 16GB of memory. Storing games shouldn't be too difficult with a 1TB Seagate ST1000LM014 laptop solid state hybrid drive with the ability to expand just in case. On the outside, this Steam Machine beta hardware has a host of ports, new and old including the legacy PS/2 keyboard/mouse port. Gamers will probably more readily use either the two USB 2.0 or four USB 3.0 ports for plugging in a mouse and keyboard. HDMI, Dual-link DVI and DisplayPort cover the bases for the visual output, while audio is taken care of with four of its own ports: 3.5mm audio in/out, rear speaker, c/sub and mic. eSATA and RJ-45 Ethernet ports and WiFi antennas can also be found inside. The price of these powerful living room PC components is said to be roughly $1,300 (about £794, AU$1,470), making it significantly more expensive than Xbox One and PS4, at least in beta form. Kinect co-creator is reportedly making Windows wearable. Whoa.